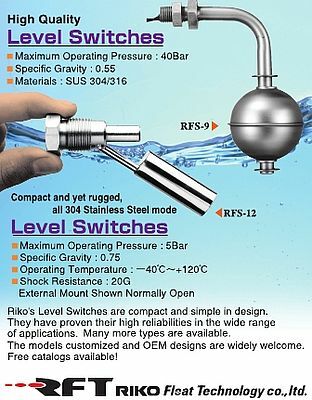 Riko's Level Switches are compact and simple in design. RFS-9 offers a maximum operating pressure of 40 bar, specific gravity of 0.55, in SUS 304/316 material. RFS-12 for pressures up to 5 bar, temperatures of -40 to 120ºC, specific gravity 0.75.